It’s 100 years since the Russian Revolution ushered in Communism and the Soviet Union, assorted galleries and museum in London are celebrating the occasion. 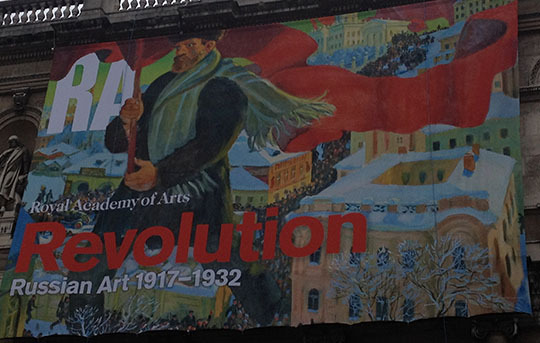 The Royal Academy on Piccadilly features Revolution: Russian Art 1917–1932 which runs until 17 April. It covers the 15 years from 1917, when enthusiasm was high and the art was varied, eclectic, imaginative, hopeful, revolutionary even. Stalin soon ended that and the dreams retreated into the sterile formulae of Social Realism, tightly controlled and unvarying. And do they never learn, Stalin’s farm collectivisation led to famine and monstrous numbers of deaths, so what did Mao in China and Pol Pot in Cambodia do? Repeat the failed experiment with exactly the same end result: millions of deaths. History, humans – particularly politicians and dictators – never seem to pay attention to it. One little surprise at this exhibition is that so much of the art has been lent by Russian institutions, despite which the accompanying text is straightforward and honest. Much of what followed the high hopes of the revolution was tediously disappointing. Kensington’s new Design Museum, housed in the old Commonweath Centre on Kensington High Street, features Imagine Moscow, running until 4 June. The exhibition covers six great revolutionary Moscow architectural projects, none of which got built. The Cloud Iron by El Lissitzky was a concept for horizontal skyscrapers, an idea which finally seemed to emerge in the form of some recent Chinese dream buildings. It’s the Palace of the Soviets which gets the main display, but although they have drawings, photographs, designs and illustrations there are no model of the project. There was one at the Royal Academy exhibit. I wrote about the extraordinary building after Maureen and I travelled on the Trans-Siberian Railway in 2013 when the building’s design by Boris Iofan featured in an exhibit at Sir John Soane’s Museum in London. The project got as far as demolishing the gigantic Cathedral of Christ the Saviour, but the Palace of the Soviets, a skyscraper taller than the Empire State Building topped by a statue of Lenin bigger than the Statue of Liberty was never built. For years the basement lived on as a huge open air swimming pool (good to see on a sub-zero Moscow winter day) and today the church has been rebuilt, as if Stalin had never existed. 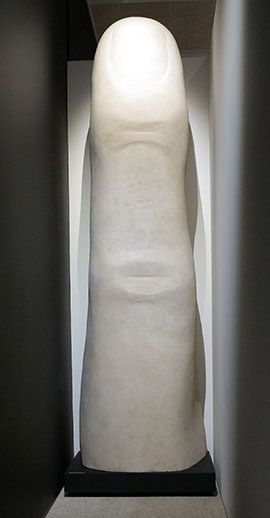 ◄ The Design Museum exhibit features a gigantic three metre long Lenin finger, the size of the one with which the statue would have been pointing dramatically towards the Rise of Communism, or some other revolutionary dream.